Trajan. AD 98-117. AE Quadrans of the Dardanici Mine. Denomination : AE Quadrans. Mint : Uncertain Balkan mint. Reference : Sear-3251, RIC 703. Size : 17.1 x 17.8 mm. Weight : 2.67 grams. Grade : VF/F for wear, but the metal is rather rough on both sides. Obverse : Head of Trajan right, with IMP CAES NERVA TRAIAN AVG GERM around. Reverse : Female standing left holding a branch, with DARDANICI around (the first three letters are off the flan). 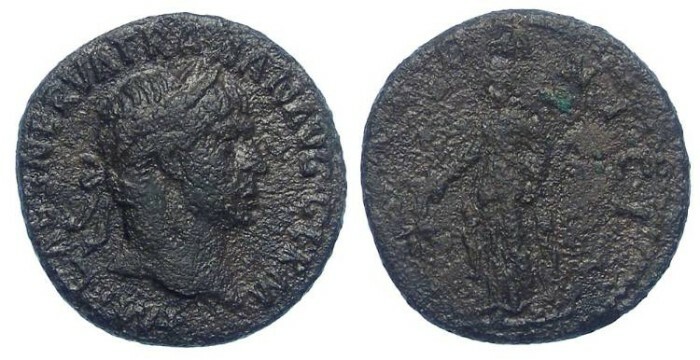 I note that these do not have the S C on them, meaning they were not issued under the authority of the Senate, and so cannot be part of the main Roman Imperial coinage system of the time. It is not clear under who's authority they were issued, but it is likely there were made specifically for use in the mines.